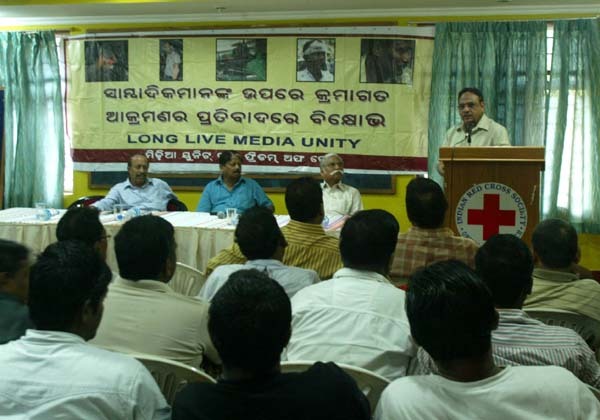 Media Unity for Freedom of Press (MUFP) in its emergency meeting conveyed to discuss about continuous attack on media persons in Orissa, adopted three Resolutions after deep deliberations today in the auditorium of the Red Cross Bhawan. In his introductory speech, member of MUFP Presidium Prasanta Patnaik gave a detail picture of how media persons are being targeted by the police and implicated in false cases in a deliberate attempt to gag freedom of Press so that people stay in dark about corporate exploitation. Shenanigans involved with the arrest of the Publisher of Suryaprava, a paper marked for upright presentation of news and views, is an instance of how media persons are being subjected to rash prosecution in Orissa, he said. Editor in Chief of Suryaprava, former CBI chief Uma Shankar Mishra observed that the way Swain was arrested and forwarded to Court was not only violative of the Supreme Court guideline on arresting a person, but also is indicative of the Police at present acting under wrongful political pressure. He was shocked that harsher sections of Arms Act are pressed against a man who never knows how to grip a gun, probably in order to make his case non-bailable. 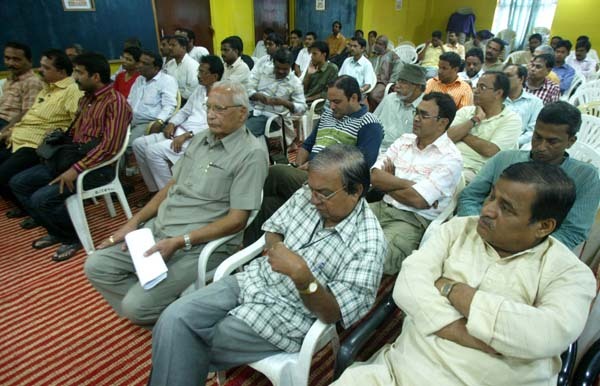 Veteran trade unionist and journalist Dwarika Mohan Mishra placed on records that repeated judicial directions for action against the Vedanta owner / operator are sloughed over by the Police whereas it has, in sharpest speed, arrested and pushed into the jail a man who is publishing a newspaper that puts up the voice of the common man. Modus operandi of the police in the instant case is therefore vitiated with malice, he pointed out. Dinalipi Editor, Batakrishna Tripathy, also an eminent IPS Officer (Rtd) strongly disapproved the inhuman execution of the arrest of Swain when it was known to them that he was on his way to a hospital carrying with him medicines and food for his father fighting cancer. The speed and haste in which the arrest and subsequent steps were executed leads one to believe that the police has acted with a motive. The law-keepers should appreciate that the tradition of Press-Police cooperation in bettering the society which was in vogue in Orissa should not be given such a burial, he said. Senior journalist Dulal Mishra congratulated MUFP for its role beyond boundaries of trade unions to stand with media persons willfully prosecuted against by Police and attacked by unsocial elements. Senior journalist Sampad Mohapatra came down heavily upon the style of functioning of the present regime and stated that if media failed to raise its voice against all forms of attacks and atrocities on its right to dissent and air critical views there is every possibility that the powers that be will take it for granted. Gopal Mohapatra, on behalf of Sambad Editor Soumya Ranjan Patnaik, expressed deep concern over repeated police atrocity on persons involved with media. Prof, Banikanta Mishra,XIMB stressed on upright reporting when Pradyumna Satapathy emphasized on solidarity of media persons. 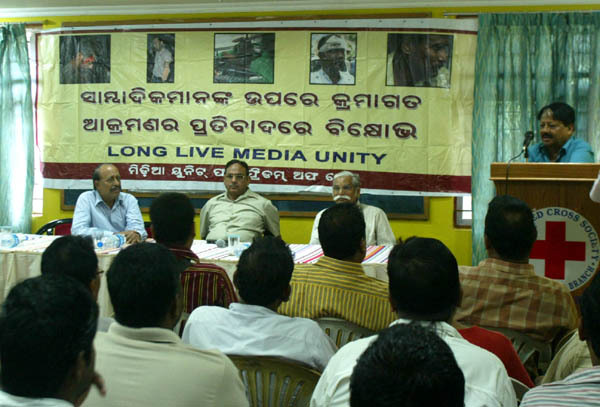 Ramesh Mohanty dwelt on how MUFP has given a platform for united action of media persons against gagging of Press. Sudhir Patnaik condemned the rash actions of police against Swain and called upon the convention to define future course of action against all such atrocities. He said the arrest of the Suryaprava publisher was intended to terrorise the media that dares take on the state government. Subhas Chandra Pattanayak in his concluding speech pointed out how the police which had failed to take action against criminals and hoodlums turned hyper-active when asked by political bosses to victimise and punish media persons. It shows clearly how criminalisation and politicisation of the state police is now complete, he said. Democratic norms can be safeguarded only if media chooses to keep the police and the state repression under check, he maintained while reiterating MUFP’s resolve to combat misuse of power by the police and the state government. Media Unity for Freedom of Press (MUFP) in its emergency meeting conveyed to discuss about continuous attack on media persons in Orissa, condemned today the inhuman manner in which Suryaprava publisher Bikash Swain was arrested by Bhubaneswar Police leading to his landing in the jail. The convention formed a Fact finding committee with Prasanta Patnaik, Batakrishna Tripathy, Subhas Chandra Pattanayak, Sampad Mohapatra, Gopal Mohapatra and Sudhir Pattanaik as members to investigate into and report on atrocities perpetrated on media persons starting with the instant case. MUFP further resolved to stage a demonstration before the Raj Bhawan on 22 Sept 2010 in protest against the rash prosecution against Bikash Swain in blatant violation of the Supreme Court guideline on arrest of any citizen. I firmly stand behind MUFP’s efforts to stand up for the freedom of press and join all members in condemning the police action against a newsman. I fully share the view that the action is a state bid to force newspapers and other media agencies to fall in line. Needless to say I am a signatory to the resolution. till now very less people are born on this earth who are capable of accepting their fault…..police acted vulgar by arresting SRI BIKASH SWAIN who is a true and able son of orissa .as a citizen of india we need to fight against this……….I STRONGLY SUPPORT MUFP..
it is having its own recognition and position in media line. Because it is reflecting the roll of the govt. well.